The 11th hour knockout delivered when Peter Graham fought Badr Hari at the K1 WGP in New Zealand, 2006. Peter Graham was big as a teenager, but not the biggest. He was also tall, but not the tallest. In fact, other than some experience playing Rugby League as a kid growing up on the North Shore of Sydney, he’d done very little in the way of athletics by the age of eighteen. There was no history of outstanding sporting performance to let anyone, much less the young Peter Graham, know exactly what was in store when he finally walked into the Kyokushin Karate dojo near his home. Kyokushin spoke to Peter on many levels. It gave him more than an outlet; it provided a direct focus for his energies. He quickly distinguished himself as an upcoming prospect when he won his first tournament; the under yellow belt division of the New South Wales Full Contact Karate championships. This was the first of a number of wins which built not only Peter’s confidence, but his reputation. Kyokushin, at that time, was almost unique amongst martial arts; it was an international amateur organisation that was presided over by its founder; the Korean-born Masutatsu Oyama. Peter believes that ‘Mas’ Oyama, possibly the most famous martial artist since Bruce Lee, was the prototypical MMA fighter. “Oyama travelled the world, fighting all kinds of people, boxers, whoever, to find out who was the best and to truly test out the style he had developed.” This willingness to risk his reputation and the style he had invented defined Mas Oyama as a “man’s man”; the kind of figure Peter sought to emulate. Oyama died in 1994 and the style that was his legacy was soon riven by politics. These issues would come to effect and define the careers of many martial artists, Peter among them. As Peter’s success continued, opportunity followed. He won the Australian Open-Weight Full Contact Karate championship in 1999 and shortly after, became the South Pacific champion. He then moved to Ikebukuro in Tokyo, Japan, to undertake the ultimate challenge for any karateka, the Uchi Deshi program. ‘Uchi deshi’, literally ‘inside student’, live in the dojo and are subjected to as much karate as they can take, and then some. “We trained three times a day,” remembers Peter. “The first session was at about 6, then we would eat and rest, and then have a second session at about midday. At around this time, Peter met Nicholas Pettas. Pettas, a Greek-Danish karateka and hugely successful martial artist in his own right, would prove to be a great influence on Peter. 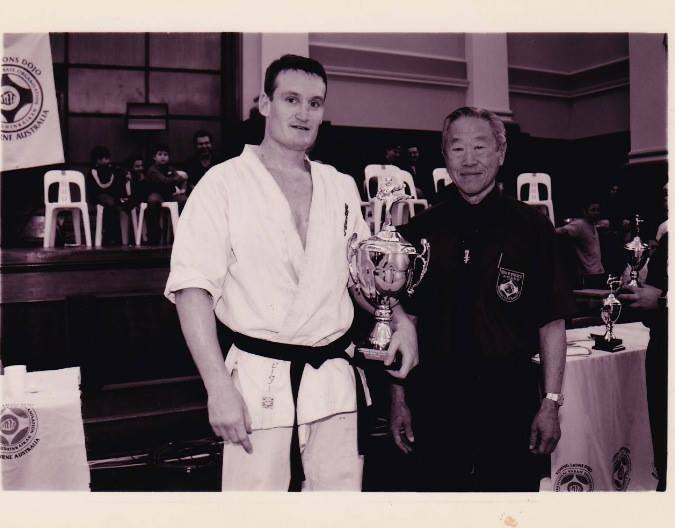 However, Peter only completed three months of his time at Kyokushin’s Honbu headquarters before having to return to Australia because of the death of his brother, Matthew. Peter had earned his black belt in the space of five years, which is quick in a style which is as eager to impede its students as much as push them forward. A Kyokushin black belt is not to be taken lightly, and is therefore earned with great difficulty. By this time, Peter was well-known in the upper echelons of Kyokushin, and had developed relationships with many of its stars. They were all looking in the same direction; towards the newly-minted K1 organisation. The ‘K’ in K1 stands for ‘Kakutogi’, a Japanese word which, loosely defined, refers to any fighting style which is ‘stand-up’. The goal of its founder, Mr Ishii, was to create a competition with standardised rules under which all stand-up martial arts – Karate, Tae Kwon Do, Kickboxing, Muay Thai – could compete for the purpose of finding out which was the strongest. Peter made the shift into kickboxing at the age of 21. By his own admission, to begin with, he “kicked and punched,” rather than kicked and boxed. It seemed to be enough, however; he won the WKBF world amateur kickboxing title with a record of 17-0. He turned pro after that with spectacular success. His winning streak remained uninterrupted for another 3 fights, until the inevitable happened. “My first loss was to Stan the Man Longinidis, on points,” he says. Undeterred, Peter fully shifted focus from Karate and into Kickboxing, pouring all his energies into becoming the best kickboxer he could be. He kept winning and soon found himself keeping company with the best fighters in the world. His second career loss was to Mark Hunt in the final of the 2001 K1 preliminary tournament in Melbourne. The year finished well for him, however, as his reputation was reaching the right people; he was invited to take part in the K1 WGP in Osaka. He had a first round win again the South African Jan Nortje, while losing in the semis to fellow Australian, Adam Watt. While he lost those contests, names like Mark Hunt and Adam Watt adequately illustrate the kind of company Peter’s success had propelled him into. He continued to make an impression on the international stage while racking up the wins on the domestic front. In 2002, however, he met Jason Suttie for the first time. “Jason’s never an easy fight,” says Peter. “Every time, he looks like he’s come there to kill you.” Suttie brought that fight to a draw and, next time they met, took the decision for a win. So began one of the greatest rivalries in Australian Kickboxing. They would fight another 3 times over the coming years, with two wins apiece and a draw between them. Peter came off his end-of-year loss to Jason in 2002 with another seven fights throughout 2003. This was his most visibly successful year; he defeated Sam Greco at Final Elimination and earned his place in the K1 Final 8. It was there he met little-known Dutch fighter, Remy Bonjasky. The tournament was a huge affair at the Tokyo Dome; the venue so large that the competitors had to be ferried to the ring in modified golf buggies. As is often the case in K1, it’s a long and difficult road to the top, where your stay can be brief. Bonjasky introduced Peter to his flying knee, and simultaneously the world was introduced to one of the most spectacular heavyweight fighters ever. Peter’s campaign was finished by TKO a few seconds short of the end of the first round and Bonjasky went on to win the first of his three K1 championships. Peter’s consequent appearances in K1 were few and far between. The reasons for this are shrouded in mystery and Peter makes no attempt to explain it. “K1 are a very professional organisation” he says. Fight-fans the world over wonder as to its credibility, however, on a number of fronts; the host of gift decisions made to journeyman Japanese heavyweight Musashi, for example, and the mysterious decision win awarded to Remy Bonjasky after the summary flogging Jerome Le Banner handed him at the 2006 K1 WGP in Amsterdam. Whatever the reason, Peter didn’t maintain circulation with the other fighters who had made the Final 16. The majority of Peter’s subsequent fights were back in Australia, where he remained dominant. Peter significantly fought and defeated Alexei Ignashov in 2005. “Ignashov said it was his hardest fight ever.” Peter suffered only two losses, one to old rival Jason Suttie and another to Doug Viney, another fighter to go on to big things in the global K1 arena. One of his most famous fights, and arguably one of the most exciting K1 fights ever, was a narrow win over rising Dutch Wunderkind, Badr Hari. 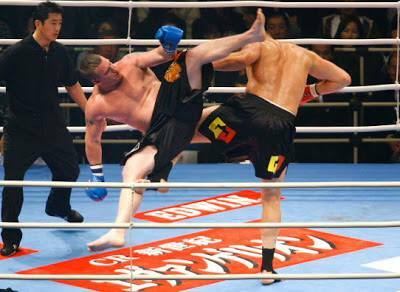 Hari had brutally KOed the German K1 regular Stefan Leko with a jaw-breaking spinning kick and was becoming as famous for his obnoxious antics as he was for his extraordinary style. In 2006, New Zealand secured a major coup; K1 consented to hold one leg of its WGP in Auckland and the strong Oceania contingent was balanced against some of the biggest names in the sport. Hari was a late inclusion in the draw and Graham was pitted against him. Things almost got off to an early start at the weigh-in when Hari told Graham he was too old and kissed him. Peter took him down, exercising some of his new MMA training and everyone on-hand got involved in prising the two apart. Come fight day, the aggression from the weigh-in had taken root and both fighters bought it to the ring. Peter hammered Hari, who miraculously stood up to the pounding and dished out plenty of his own. It was a close three-rounder that, in its dying seconds, looked like it might go the Dutchman’s way. Until, Peter pulled out his jumping spinning kick dubbed the ‘rolling thunder’. It caught Hari on the jaw and sent him off to sleep for so long his seconds had to carry him from the ring. 2006 was a busy year, culminating in one of Peter’s most significant achievements; bringing Semmy Schilt to a five round decision at ‘Dynamite! !’, the K1 New Year’s Eve show. For a while, it looked like Hari might become Graham’s ticket back into the big time. After a lengthy recovery, Hari returned to the ring and a revenge match was scheduled for the Hong Kong K1 in 2007. Both men fought a cagey fight and the contest failed to generate as much of the risky excitement of its predecessor. Hari took the decision win. In his first MMA contest, Peter found himself opposite Kazuyuki Fujita. Fujita is a MMA fighter with a background in wrestling who had met most of the significant heavyweights passing through the competition; Fedor, Mirko Crocop and Mark Kerr among them. Peter made a strong start but seemed at sea under the unfamiliar rules; Fujita won by submission part-way into the first round. Peter’s performance in MMA hasn’t been as strong as his stand-up pedigree might suggest. He suffered another defeat at the hands of Frenchman Moise Rimbon and then again to Rolles Gracie late last year. “MMA is hard,” Peter says, shaking his head. He has been diligent in his training, however, having moved to Marta Grosa dos Sol in Brazil to earn his blue belt in Brazilian Jiu Jitsu. Peter continues to teach and train out of the Boxing Works Gym in Darlinghust, Sydney. He has also begun to distinguish himself as a trainer, with rising star Steve Moxon among his charges. He continues to study MMA diligently. It has become the next mountain to climb. In a sport seemingly dominated by violence and distinctly ‘American’ displays of bravado and bad sportsmanship, fighters like Lyoto Machida, George Saint Pierre and Peter Graham bring a traditional martial style. These are fighters who define themselves both through their ability and their willingness to test themselves. Like Mas Oyama, they demonstrate and further the proud tradition of Budo, the warrior’s way. This entry was posted on September 14, 2010 at 7:24 am and is filed under Journalism, Kickboxing, Peter Graham with tags Alexei Ignashov, Badr hari, Jason Suttie, K1, Kyokushin karate, Mas Oyama, Nicolas Pettas, Peter Graham, Remy Bonjasky, Semmy Schilt, Sengoku, Stan Longinidis, Stefan Leko. You can follow any responses to this entry through the RSS 2.0 feed. You can leave a response, or trackback from your own site. Pete’s a legend and a hell of a nice guy too. I wish there was more out there about him.